Ferdinand II (9 July 1578 – 15 February 1637), a member of the House of Habsburg, was Holy Roman Emperor (1619–1637), King of Bohemia (1617–1619, 1620–1637), and King of Hungary (1618–1625). His rule coincided with the Thirty Years' War. Ferdinand's aim, as a zealous Catholic, was to restore Catholicism as the only religion in the Empire and suppress Protestantism. 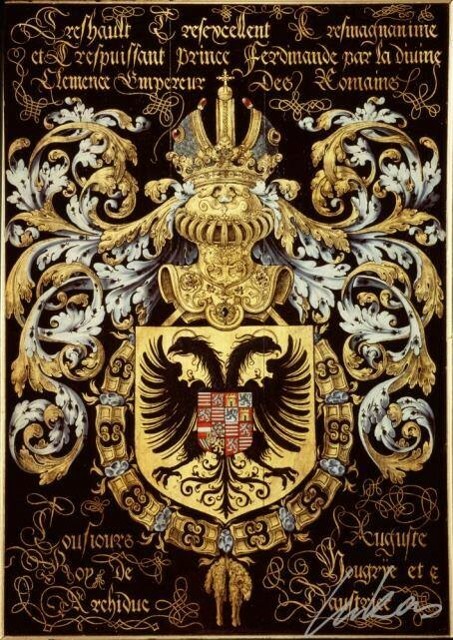 He was born at Graz, the son of Charles II, Archduke of Austria, and Maria Anna of Bavaria. He was educated by the Jesuits and later attended the University of Ingolstadt. After completing his studies in 1595, he acceded to his hereditary lands (where his older cousin, Archduke Maximilian III of Austria, had acted as regent between 1593 and 1595) and made a pilgrimage to Loreto and Rome. Shortly afterwards, he began the suppression of Protestantism in his territories. 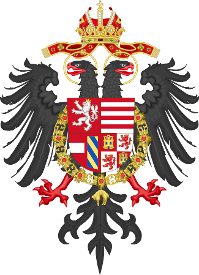 With the Oñate treaty, Ferdinand obtained the support of the Spanish Habsburgs in the succession of his childless cousin Matthias, in exchange for concessions in Alsace and Italy. In 1617, he was elected King of Bohemia by the Bohemian diet, in 1618, King of Hungary by the Hungarian estates, and in 1619, Holy Roman Emperor. His devout Catholicism and negative regard of Protestantism caused immediate turmoil in his non-Catholic subjects, especially in Bohemia. He did not wish to uphold the religious liberties granted by the Letter of Majesty conceded, signed by the previous emperor, Rudolph II, which had guaranteed the freedom of religion to the nobles and the inhabitants of the cities. Additionally, Ferdinand was an absolutist monarch and infringed several historical privileges of the nobles. Given the relatively great number of Protestants in the kingdom, including some of the nobles, the king's unpopularity soon caused the Bohemian Revolt. The Second Defenestration of Prague of 22 May 1618 is considered the first step of the Thirty Years' War. In the following events he remained one of the staunchest backers of the Anti-Protestant Counter Reformation efforts as one of the heads of the German Catholic League. 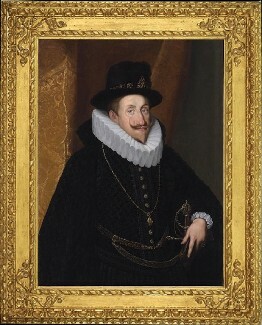 Ferdinand succeeded Matthias as Holy Roman Emperor in 1619. Supported by the Catholic League and the Kings of Spain and the Polish-Lithuanian Commonwealth, Ferdinand decided to reclaim his possession in Bohemia and to quench the rebels. On 8 November 1620 his troops, led by the Flemish general Johann Tserclaes, Count of Tilly, smashed the rebels of Frederick V, who had been elected as rival King in 1619. After Frederick's flight to the Netherlands, Ferdinand ordered a massive effort to bring about re-conversion to Catholicism in Bohemia and Austria, causing Protestantism there to nearly disappear in the following decades, and reduced the Diet's power. Despite Wallenstein's fall, the imperial forces recaptured Regensburg and were victorious in the Battle of Nördlingen (1634). The Swedish army was substantially weakened, and the fear that the Habsburg's power would become overwhelming caused France, led by Louis XIII of France and Cardinal Richelieu, to enter the war on the Protestant side. (Louis's father Henry IV of France had once been a Huguenot leader.) In 1635 Ferdinand signed his last important act, the Peace of Prague (1635), yet this did not end the war. Archduchess Cecilia Renata of Austria (16 July 1611 – 24 March 1644), who married her cousin W?adys?aw IV Vasa, King of Poland.